In Scott Fitzgerald's The Great Gatsby, one of the characters, Tom Buchanan, a rich man who's also a well-known polo player, says, "I've heard of making a garage out of a stable, but I'm the first man who ever made a stable out of a garage." Not to brag, but I'm doing the same thing. Whenever I find a quality LP recording of a piece I have on CD, I don't hesitiate to sell the CD and buy the LP. And when I find a better-quality recording, something closer to the original, I don't hesitate to trade in the old LP for a new one. It takes a lot of time to pursue this, not to mention a considerable investement of cash. Most people would, I am pretty sure, label me obsessed. The kindred spirit is Japanese novelist Haruki Murakami writing in his new memoir What I talk about when I talk about running. And talking of the same piece on LP and CD my photo shows three generations of a recording I couldn't possibly live without. The HMV LP of Sir John Barbirolli conducting the Sinfonia of London and the Allegri Quartet in music by Vaughan Williams and Elgar is one of the classics of the gramophone. This is passionate, heart-on-sleeve music-making captured in stunning stereo sound. Just listen to the Sinfonia of London's rich vibrato in the Elgar, and compare it with Roger Norrington's 'historically informed' alternative. There is simply no contest. Every track on the LP, which was produced by HMV's Victor Olof, is a masterpiece. But Vaughan William's Fantasia on a Theme of Thomas Tallis is up there with the best things ever committed to disc. The LP seen above was released in 1963 (note the old-style HMV logo), and first transferred to CD in 1986. The original CD packaging, seen above, cleverly echoed the classic 1963 LP sleeve, but was, in fact, completely different. The works listing included two additional Elgar pieces, Elegy & Sospiri. These were recorded at a later date (1966) with a different orchestra and producer (Christopher Bishop) and added to fill the CD. The photo on the CD is from the same session as that on the LP, but it is a different angle and tighter on Sir John to allow for the smaller size picture. Both photos were taken by Godfrey MacDominic at the Kingsway Hall sessions for the Elgar Introduction and Allegro, and the Allegri Quartet are in the foreground. The reason why the sound is so outstanding is evident in these photos. There is a notable absence of microphones, with just one pair on a tripod high over the players visible to the right of the LP photo below. Herrmann insisted that "it must be done in a stone building not a studio". So Herrmann suggested the Temple Church. The recording session was started at midnight to avoid traffic noise. According to Ursula Vaughan Williams (the composers widow): "Coats and bags and thermos flasks were piled round the effigies of Crusader Knights. Benny was there, listening to the balance, listening to the music, and the resulting record is by far the best ever made of the work." The sound from the Temple Church recording of the Tallis Fantasia is quite exceptional. But there is, to my knowledge, no visual record of how it was achieved. Perhaps because Godfrey MacDominic had already covered the Kingsway Hall sessions, there was no photographer in the Temple Church. For whatever reason, there are no photos of the session that produced one of the greatest recordings ever made. 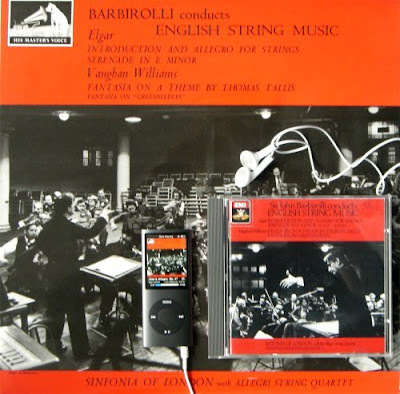 In 2000, the CD of Sir John Barbirolli conducting English string music was re-released in EMI's Great Recordings of the Century series, with the original LP sleeve as a thumb-nail image on the CD packaging. The disc is currently available from Amazon at mid-price, but I couldn't find it listed on the EMI Classics website. If you don't have this 'recording to die for' buy it quickly before it makes way for the next Libera release. And yes, the sleeve image on my iPod is from the original LP. Label me obsessed. Read About 'Glorious John' in New York here. And about Haruki Murakami here and here. One incredible, and often overlooked, EMI recording of Sir John Barbirolli is his Beethoven's Third Symphony. I grew up with the ANGEL release of that recording, replete with the martial cover. I do believe it has finally be re-issued on CD. Thank godness that recordings like this exist and are still easily available, because I can say (to my regret) that English music is almost absent from concert halls here in Spain. Not even English conductors include it in their programmes when they guest-conduct some of our local orchestras. The exception, of course, is Adrian Leaper, principal conductor of the Spanish Radio Television Symphony Orchestra. He conducted a few years ago the only piece of this 'Glorious John' recording that I have ever seen performed live, Vaughan William's Fantasia on a Theme of Thomas Tallis. Interestingly, Maestro Leaper also conducts music by Spanish composers more frequently than most Spanish conductors. G-sus, thanks for that. You did start me thinking about when did I last hear any of those string works in a concert hall in Britain? The answer is actually quite a long time ago. Not because these composers are neglected, indeed the symphonies of both Elgar and Vaughan Williams are staple concert fare in British concert halls. They are rarely heard here because these particular works are difficult to fit into a concert programme, particularly in the 21st century when the emphasis is on 'significant' and weighty music. The familiarity and popularity of these wonderful string pieces is due to their availability on disc rather than in the concert hall, even in Britain. Congratulations on the ever-fascinating site (although I think you should re-listen to the Barenboim New Year's Concert - fine music-making and not his fault that the moronic commentary is, as you say, promoting all his endeavours and not focussing on the music). Thanks for that Mike. I too was puzzled by that reference to the Alcazar Hall, Monte Carlo. But it did exist as a recording venue, and Barbirolli did guest conduct the Monte Carlo orchestra so he knew the hall. I too remember a written reference to the VW session, but also could not locate it. Is it in Michael Kennedy's biography of Barbirolli? Let me know if you can clear the mystery up. You may well be right about the reason for the late night sessions. But, as the same players were in the Elgar sessions in the Kingsway Hall, I thought, possibly wrongly, there was a reason for the timing connected with the Temple Church. 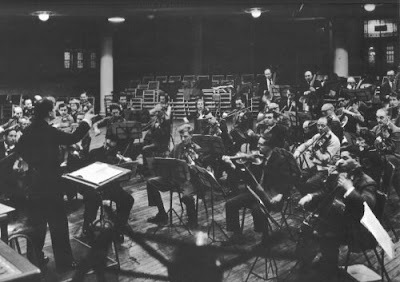 The back cover of the CD edition in the EMI Great Recordings of the Century series states that the Elgar works and the Greensleeves were recorded in the Kingsway Hall. And the Fantasia on a Theme by Thomas Tallis was recorded in Temple Church a week later. Michael Kennedy writes in the liner notes that "the venue was suggested by the American composer and conductor Bernard Herrmann, a friend and admirer of Sir John since his years in New York". He also mentions that Ursula Vaughan Williams wrote that "the recording sessions started at midnight to avoid any traffic noises". Many thanks to the readers above who have supplied information. In true collabarative Wiki fashion this has allowed me to correct and enhance my original text. The spurious reference to the Monte Carlo recording venue has been removed. I have added a very valuable link to the Bernard Herrmann website which gives information about the Tallis recording in the Temple Church. That Bernard Herrmann web page is a gem. I will return to it. Thanks again to the readers who help make An Overgrown Path such a rich resource. Do keep the comments coming. Was the original catalogue number for this recording EMI ASD 521? Brian, yes it was. I have the LP in front of me. It is ASD 521. I did think about putting catalogue numbers in my posts as those ASDs have a certain nostalgic ring. But only, I fear, to the pre-MP3 generation. I have the CD re-issue and agree that this is a very special performance. But, sadly an original LP has so far eluded me. This recording has often been promoted by Art Dudley and others in the American audio press as not only a brilliant recording and performance, but an ideal introduction to classical music for the uninitiated. Consequently originals have become even more collectible and difficult to find. It was released in the US as Ang. S 36101. I was pleased to stumble on this entry. I thought a friend and I were the only two obsessives who liked to seek out clean, good-resolution images of the original LP artwork for classical LPs and use them (in place of the often quite hideous re-issue CD covers) on our iPods. Hurrah for the obsessives! By the way, love the image of the JB Elgar/RVW String Music LP - is there any chance of a jpg of that to add to my collection please? !